The Altare della Patria is a controversial building in Rome. Known as “The Typewriter” by many because of its design, the stark white ‘Altar of the Fatherland’ is dedicated to Victor Emmanuel II – the first king of modern Italy – and also contains the tomb of the unknown soldier. 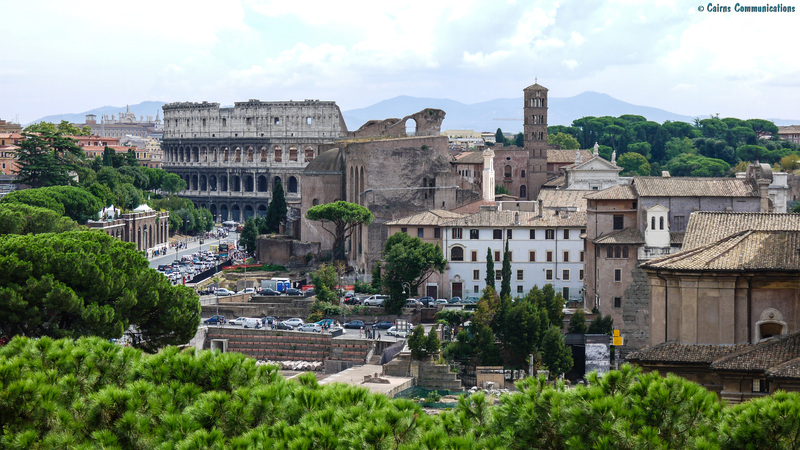 It was built in the period after World War One, and was adopted by the rising Fascist movement as a monument to their rising influence – and its construction meant the demolition of many ancient building on Capitoline Hill. In the 1990s, a new elevator was added, allowing tourists to get to the roof – for stunning views of Rome, like this one. Travel Pics Theme: R for Rome. Angels .. don’t blink!